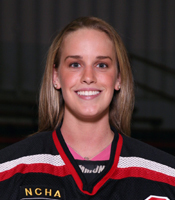 LAKE FOREST, Ill. - Lake Forest College women’s hockey player Sally Bevis (Huntington, N.Y./North American Hockey Academy) was named Forester Athlete of the Week on Thursday (February 22) for her performance in Friday’s (February 16) 1-1 tie at UW-Stevens Point, the nation’s seventh-ranked team. Bevis, a senior goaltender, stopped a season-high 42 of 43 Pointer shots on goal (97.7%) in the contest. It was her sixth straight game with at least a .929 save percentage and her season mark of .941 ranks third in the nation. Bevis has now recorded 40 or more saves in a game six times in her career. The Forester Athlete of the Week is selected by the Athletic Department on Thursdays. She also earned the award once as a sophomore.